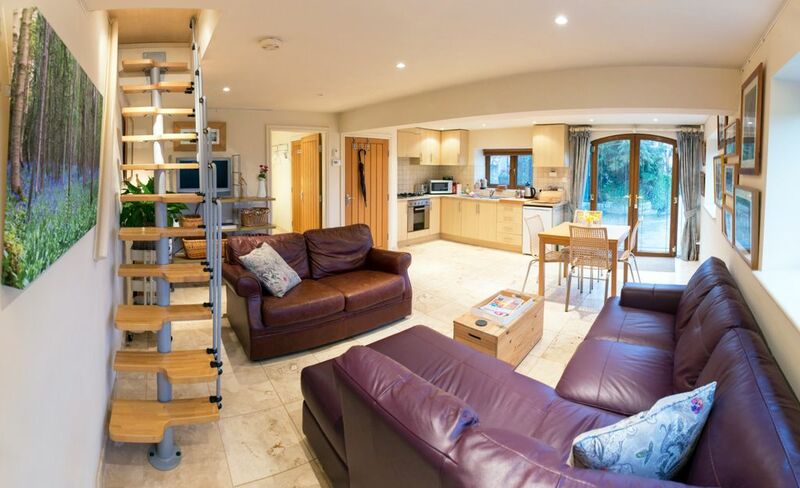 A luxurious and comfortable two bedroom detached holiday cottage which is spacious and fully self contained, sitting 300 feet above the city of York on a wooded hillside that lies between two castles. The dramatic ruins of King Richard III’s Sheriff Hutton Castle and the Baroque majesty of Castle Howard (famous as the location for the film and TV series Brideshead Revisited). Off the beaten track with big views over the Yorkshire Wolds & the Vale Of York, yet just 11 miles away from the ancient walled city of York. Our guests say they really love the peace and quiet here after a days sightseeing in York or the coast and we get lots of positive feedback about what a great nights sleep they enjoyed in our King Size & Super King Size beds with memory foam toppers. The ground floor has marble tiled floors with under floor heating (from our eco friendly Air Source Heat Pump) for a very cosy winter break or a cool summer holiday style apartment. Bring your dog/s along too as we are pet friendly and surrounded by scenic traffic free woods and rolling farmland to walk the dogs in. There is a charge of just £15 per dog stay (2 max or 3 if small breed) and doggy day care may be available on request too. Ground floor has under floor heating from an air source heat pump. Electric rads to first floor. Free parking for up to 4 vehicles on site. FREE High speed satellite broadband Wifi. Usually 15-25 MB download speed. A large white fluffy bath towel and hand towel is provided for each guest. 3 seater double sofa bed, 2 seater leather sofa, arm chair, coffee table, dining table & 4-6 dining chairs. TV (freeview). Small speakers for phone iPod etc. Fridge with freezer compartment and use of another freezer if required. Fresh milk on arrival, teas, coffee, sugar, short bread biscuits, cooking oil, salt & black pepper. Living room and kitchen are combined to make a great space for your stay. The kitchen is fully equipped. There is also a freezer and laundry facilities on request for longer stays. Table extends to dine up to 6 persons comfortably but 8 can be fitted around the table too. Large enclosed gardens. Next to farmland with occasionally sheep in the paddock alongside. Secure for dogs that don't jump over fences or small dogs that can get through very small gaps. Sun terrace, tables and chairs. There is rear access with no steps into the ground floor bedroom, however please call us to discuss first. Stayed with my disabled mother, for whom downstairs bedroom and ensuite were perfect. Very comfortable and thoughtfully equipped property in a quiet hamlet in delightful area: perfect for people who like history (Richard III's castle nearby as well as Castle Howard), gardens, good food, cosy pubs, pretty villages and walking. Excellent hosts, ready with helpful local advice but also give guests plenty of privacy. We particularly appreciated the delivery of fresh towels and a pot of home-made jam part the way through our stay. Heel rustig landelijk gelegen, toch dichtbij pubs en shops, heel mooie streek. fantastische lieve uitbaters : Richard en Kim. Nice area to explore. Very well catered cottage and extremely comfy beds. Great base for a beautiful area.